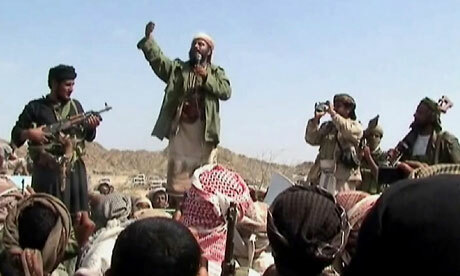 Armed men claiming to be al-Qaida members address a crowd in Yemen’s southern Abyan province. Photograph: AFP/Getty ImagesThe market at Jaar, a small city in Abyan province in southern Yemen, is on a filthy, dusty road strewn with garbage, plastic bottles, cans and rotten food. Plastic bags fly on the hot wind and feral dogs sniff around the vegetable stalls. Minibuses and donkey carts jostle for space on the crowded street. Standing in the middle of the chaos is one of the jihadi gunmen for whom the town has become famous. Thin, short, with a well-groomed beard and shoulder-length hair, he is dressed in the Afghan style: shalwar kameez, camouflage vest and an old Kalashnikov. He is either a bandit imposing a protection racket on the merchants or a rebel protecting them from the corrupt regime – and most probably a bit of both. He waves cheerfully to the people passing by, but few give him a second glance. The jihadis – like the chaos and the filth – are an established part of the landscape of south Yemen. They attend state-run mosques and Quranic learning centres and help fill the ranks of the country’s security forces. Recently, their influence has grown more threatening. In the past two years al-Qaida has established a local franchise in Yemen, al-Qaida in the Arabian Peninsula (AQAP), which has claimed responsibility for audacious attacks – including the attempt to assassinate the British ambassador to the capital, Sana’a, earlier this year. In Yemen, recruits can study ideology and take guidance from militant leaders, including the Yemeni-American cleric, Anwar al-Awlaki, who has been described as “terrorist number one” by the Democrat chairman of the House homeland security sub-committee, Jane Harman. Awlaki is believed to have given guidance to the so-called underwear bombing suspect, Umar Farouk Abdulmutallab, and to Major Nidal Hasan, accused of murdering colleagues in shootings at Fort Hood. With its conservative Islam, ragged mountains, unruly tribes and problems of illiteracy, unemployment and extreme poverty, Yemen has been dubbed the new Afghanistan by security experts. The Guardian spent two months in the country, travelling to the tribal regions of Abyan and Shabwa, where al-Qaida has set up shop and where suspected US drone attacks have killed scores of civilians and few insurgents. Speaking to jihadis, security officials and tribesmen, it became clear how a combination of government alliances, bribes, broken promises and bungled crackdowns has allowed Islamists to flourish and led to the emergence of the country as a regional hub for al-Qaida. In the south, government control is slipping away fast. Bandits, lawless tribes, secessionists and jihadis are all fighting the regime. Though they have few ideological connections, the groups are all contributing to one thing: a failing state where extremism can flourish. On my first day in Jaar I toured the town with the deputy governor of Abyan province. We left the market and drove to a neighbourhood built by the Yemeni socialists in the 70s to house east European agriculturalists. The small wooden prefabs are being rebuilt with cinder blocks, as if huge grey tumours were sprouting everywhere. At the entrance to the neighbourhood, two gunmen stood guard and graffiti sprayed on the walls declared allegiance to al-Qaida. “None of those men have been to Afghanistan, you know, but it’s the look that they want to acquire,” said the deputy governor. The rise of al-Qaida in Jaar has been a gradual process of radicalisation as generations of volunteer fighters have returned from conflicts abroad: the Afghan war against the Soviets in the 1980s, as well as the Nato-led war against the Taliban and the war in Iraq in 2003. Veterans of these conflicts, as well as jihadis who have never fought abroad, are in the streets of Jaar fighting for influence. In the 1970s and 1980s, Jaar had been predominantly a socialist town. But when the regime in Sana’a fought the socialists in a short civil war in 1994, the Islamists fought alongside them. When the socialists were defeated, the Islamists were encouraged to take control of the area. Quranic centres, the Yemeni equivalent of madrassas, were established with government support. Over the next 10 years, the town became a base for the Islamists: they had jobs and they received their salaries from the government and money that poured in from Saudi Arabia, in support of the Quranic centres. I spoke to Faisal – a thin skeleton with a thick moustache balanced awkwardly on his small head – on the floor of his Spartna living room. A former Socialist party member and head of the Young Artist Association in the Abyan, he watched the Islamisation of Jaar happen. “The socialists were defeated on 7 July 1994,” he said. “On July 8 a group of Islamists came and picked me up, blindfolded me and took me to the HQ of political security. I was handcuffed and beaten there. They wanted to know if I was a communist and their commander declared I was one. Then they tied my arms to a tree and hung me there and started beating me up with a stick. “Things started changing after that,” he said. “The Islamists were given jobs, they became headmasters and officers.” They closed the cinema and converted it into a mosque. Art disappeared and gradually women started wearing the full black niqab. “Last year they killed 10 men and threw their bodies in the streets, saying they were homosexuals,” he said. One of the leaders of change in the city during this time was Khaled Abdul Nabi. I met him in his madrassa-like compound. Young men doubling as students and bodyguards lurked in the alleyway in front of his house and at the bottom of his stairwell. Khaled sat on the floor, pulling at his beard. From floor to ceiling behind him stretched bookshelves filled with thick, leatherbound books on jurisprudence and theology. A pistol was placed neatly in front of him. Abdul Nabi went on to form the Abyan-Aden Islamic Army in 1998, one of the first jihad-inspired groups operating in Yemen. It is accused of being behind several violent acts, including bombings and assassinations of security officers, as well as the kidnapping of 16 foreign tourists in 1998, which led to the deaths of four hostages. In August 2008, Yemeni security forces killed five of Abdul Nabi’s men in Abyan province and claimed they had arrested 28 al-Qaida supporters, including Abdul Nabi, himself. After meeting Saleh, Abdul Nabi allegedly agreed to support the president in his fights against the Shia rebels in the north and separatists in the south and last year he was released in a general amnesty with about 175 Islamic militants, many of them his own men. He returned to Abyan to rebuild his organization, which is now affiliated to al-Qaida, and called for the formation of an Islamic state in southern Yemen. One of the problems he faced now, he said, was with younger generations of jihadis. When jihadi leaders try to moderate their positions, the young followers will often splinter and form more radical groups, so each generation is more radical than the next. I was sitting with Faisal in his home in Jaar when the message came through that a young commander, Jamal, who is attached to al-Qaida in Yemen had agreed to see me. A thin teenager was sent to lead the way. We followed him through dirt alleyways between rows of small houses of concrete cinder blocks. Plastic bottles and shards of glass crunched under our feet. A window flickered with silver light from a television and two dogs chased one another to a corner and then fought viciously. In the darkness the town appeared even more desolate and wretched. We entered one of the concrete shacks, which was lit by a small red bulb. There were two rooms, one by the entrance that doubled as a kitchen and a bathroom, and one that was furnished as a bedroom with brand new furniture. We sat on the linoleum-covered floor. How had a young man living in a poor, obscure small town in the south of a poor nation, who had not travelled further than its capital city, become a threat not only to the government of Yemen, but to the world in general. “There are too many Arabic tragedies, in Iraq, in Chechnya, in Afghanistan and in Palestine, that makes us want to fight in the way of God,” he said. In 2006 he was arrested, which led to the first of several meetings with Saleh. Saleh agreed to release the prisoners in return for their promise of inactivity. Three days later Jamal was back on the streets, but trust between him and the regime did not last long. A cycle of arrests, fighting and deal making ensued, escalating the strength and anger of the jihadis. Sometimes they would be promised compensation by the president, but when they went back to Sana’a to collect the money they would be sent from one government department to the other. Weeks would pass, and so the clashes would erupt again. “Before our last meeting with the president in 2009, Jaar fell under our control. By that time, our brothers stopped going to Iraq. They said if we are not arrested on the way and we reach Iraq, either the Americans will arrest us or we would be tortured by the shia [Iraqi government]. Why not stay and fight here. A small mouse darted across the floor between our legs. It hit one of the legs and scurried under the bed. Even this young commander had trouble with the generation of radicals coming after him. Even for Jamal, who represents the post-Iraq war generation, there is another generation after him who don’t know which government property to loot and which to leave alone, a generation he thinks is unruly. I asked Jamal if he considered himself part of al-Qaida’s organisation in Yemen. “We are all connected, all the jihadis are connected,” he opened his arms and pointed at the three of us sitting on the floor. “One of us is Qaida,” and he pointed at himself, “the other is protecting him,” and he pointed at me, “and the other is providing logistics.” And he pointed at the teenager who had brought me there. As we walked back through empty dark streets I asked the teenage boy leading me how the young looked at people like Jamal. To an extent, he said, they had been trying to buy a truce. But it had been mismanaged. At Faisal’s house, I asked him what he thought of the government’s attempt to crack down on al-Qaida. He closed his eyes and sighed. “It’s a comedy,” he said. Next Labour Party – The Nasty Party ?